These caps fit the violet glass aromatherapy bottles: 5 ml., 30 ml., 100 ml. 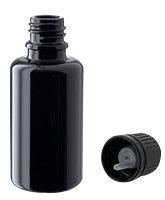 The roll-on is in the cap and when the cap is twisted onto the bottle, the roll-on goes into the bottle so that when the cap is removed, it is just a cap and the applicator is attached to the bottle. It can be reused if removed carefully from empty bottles. Contents: one roll-on cap for din 18 violet glass bottles. 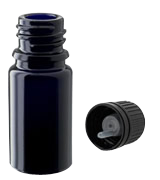 This cap fits all the essential oil bottles, but the length of tube might have to be adjusted (cut) in order to fit the smaller bottles. Contents: Spray cap for din 18 violet glass bottles. These violet glass apothecary jars are extremely high quality and are suitable for the most discerning artisan herb makers. Contents: one liter violet glass apothecary jar with glass stopper. 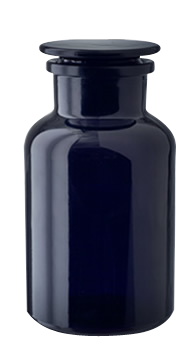 Violet Glass Bottle with Reducer Cap, 100 ml. This bottle holds just a bit more than three fluid ounces of whatever one wants to store in it. The dark glass prevents from damage due to harmful light, thereby significantly extending the shelf life of the product. The bottle comes with a reducer cap. Contents: one Miron Glass 100 ml. bottle with reducer cap. 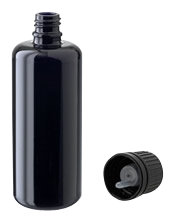 Violet Glass Bottle with Reducer Cap, 30 ml. Violet glass bottles protect the contents from deterioration due to light penetration. The bottles are exceptional quality. They come with a reducer cap and seal. When the lid is tightened, it automatically creates a safety seal and inserts the reducer into the glass bottle, allowing the user to dispense one drop at a time. Contents: one Miron Glass 30 ml. bottle with reducer cap. Violet Glass Bottle with Reducer Cap, 5 ml. These dark violet glass bottles are imported from Switzerland. They hold about a sixth of an ounce, enough therapeutic grade essential oil for many months. Contents: one Miron Glass 5 ml. bottle with reducer cap. No claim is made for the effectiveness of any formula in treating or curing any disease, and no product or information provided in relationship to any product is intended to replace the advice of qualified health care practitioners. If in doubt about specific needs, please contact your practitioner. None of these products has been evaluated by the Food and Drug Administration.